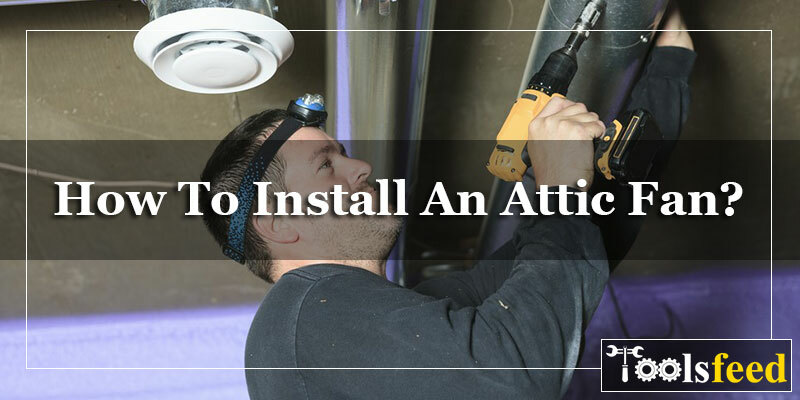 How To Install An Attic Fan And How Does It Work? Attic ventilation is an important thing which is often overlooked by everyone. If you have your own home, attic ventilation holds much significance so it should be taken seriously. As inadequate venting can lead to high attic temperature, living in such an environment might become uncomfortable. Also, it contributes in raising utility bills and cut down the life of roofing. Adding attic vents is always beneficial and for more effectiveness, an attic fan can be installed as well. Before you buy an attic fan, make sure to check the ventilation first in your house. As the roof type, design, location and sunlight are different, it is important to consider all these requirements first. 1 sq. Ft. of roof vent area is required for every 300 sq. Ft of attic area and this is the minimum venting system requirement. Every vent mounted high on a roof has to have a counterpart on the lower roof in order to let the upper vents pull cooler air into the attic through the soffit vents. When the hot air rises, the upper vents pull cooler air and if it doesn’t happen, the corners will curl up signifying that the attic is extremely hot. It is important to check the attic to avoid any extreme situations like in cold weather, look for frost inside the attic. The frost is trapped moisture which can rot the roof if not escaped. Two types of attic fan designs are there i.e. roof installation and other in which the fan is mounted in gable wall. Roof fans are mounted on sheet metal base and for that, all you need to do is cut an opening in the roof near the peak and install the fan over the opening. Next is the gable wall fan which is easy to install as compared to the previous one. If there is an existing gable vent, you just need to enlarge the opening a little bit so that it can accommodate a larger automatic shutter. But if the vent is already large enough, there is no need to replace it and simply mount the fan directly. Start by removing the screws of the old vent and lift from its opening. Mark around it using a pencil and centre the front of the automatic shutter over the vent hole. Do not forget to check if the shutter frame is on level. Once done, establish the new edges of the new opening in 5/8 inches on all sides. Now cut the new opening with a sabre saw and keep following the lines drawn 5/8 inch inside the shutter flange perimeter lines. Next, lift the new shutter in the opening and make sure to check if its level is right. Fasten it in place with 1 inch woodscrew. Take an acrylic caulk and seal the perimeter. Lastly, put the screws back on the old blocking below the bottom of the shutter. To mount the fan, you should install it on a plywood panel as it will keep the fan blades away from the wall enabling you to center and secure the assembly. Cut a piece of plywood of the size of your attic framing surrounding the vent hole. Secure the plywood on the wall and trace around it with a pencil. Cut the airway in the mounting panel with a sabre saw. Place the fan mounting bracket on the plywood piece and put the fan in the center and then screw the bracket to the plywood. Since the fan assembly has to be vertical, make the marks accordingly. Bring the fan and panel assembly into the attic and position it behind the shutter and screw it to the gable framing. It is the most important part of the whole installation. The wiring has to be done very carefully and before doing this, you need to check whether you can find an attic circuit with enough reserve capacity. As the installation needs to meet prevailing electrical codes, if you think you cannot do it yourself, seek some help from the professional to complete this work. If you choose to do it, make sure the power is off before starting any working on any wiring. As you may know, the fan’s thermostat is already mounted in a box attached to the fan. Screw this box to the plywood. Go ahead to the nearest circuit box and disconnect the fixture. Now between the open fixture box and gable wall, bore the holes in the rafters. Drill the center of the board using a 5/8 inch. Insert 12-2 w/g cable through the holes between the two boxes and attach the new cable to the rafter within 8 inch of the ceiling fixture box. Perform the same step with the cable near the thermostat box. Pull the cable through the holes in the rafters and attach it within 8 inch of thermostat box and ceiling box. As there are studs that support the fan, bring the cable through one of them and strip about 8 inch of insulation from the end. Feed the wires into the thermostat box by attaching the box connector. On the box connector, tighten the fastening nut and connect the ground wire to the green terminal. Next, you need to connect the white circuit wire to the white fixture lead and black circuit wire to the black fixture lead. Set the thermostat to activate the fan at 105 degrees F after replacing the box cover. To complete the wiring process, go back to the open fixture box and attach two 8 inch lead wires to the pull chain fixture. With a white wire to the silver terminal, connect black lead to the brass terminal. Join colored wires in twist connectors to mount the fixture. How to Repair Drywall in 9 Simple Steps?